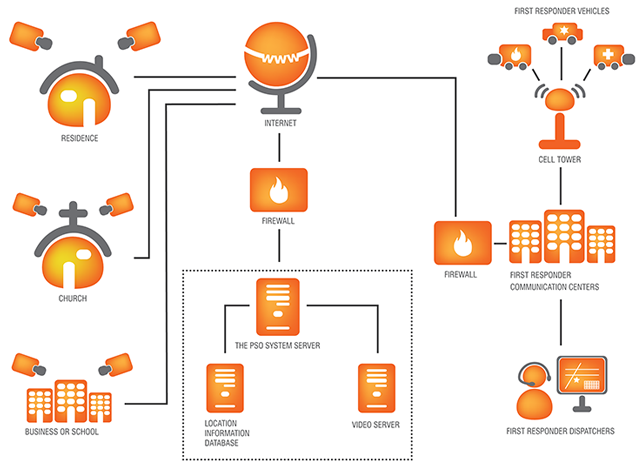 Public Safety Online is a web-based, secure application that transmits video from any camera system connected to a dedicated network directly to police, fire and other emergency service vehicles, command or dispatch centers. Public Safety Online is designed to get critical video information to those who need it before they arrive at the scene. This can improve first responder safety, tactical deployments and incident command decisions. How does Public Safety Online work? The system extends coverage to subscribing cities by incorporating public and privately owned camera systems into the dedicated network. Any government facility, public entity, private business or residence whose camera systems are part of the network can create their “In Case of Emergency” (ICE) contact information for first responders to view online along with the video feed. Participants may also volunteer their cameras to provide virtual eyes on their property. Whether it be to respond to an incident or for a quick virtual check. Public Safety Online offers secure, access controlled, real time video observation, address validation, digital mapping and GIS layering. A tactical and informational advantage through enhanced situational awareness. Enhanced surveillance capability. Especially important to watch events at popular public spaces, entertainment venues and critical infrastructure. A surveillance force multiplier during periods of civil unrest or protests. A common visual operating environment for mutual aid and interoperability between different responding jurisdictions and agencies. Emergency information and safety plans such as building layouts, gate codes, utility shut offs, and hazardous material information. Public Safety Online allows law enforcement to view cameras in real time from an officer’s car, dispatch center, or command post. It has the potential to save time and resources through virtual viewing and patrolling. This can extend patrol coverage allowing for improved response and resource allocation and can provide vital evidentiary images prior to the arrival of officers. KTI - Kari Technologies International Inc © 2018 All rights reserved.